The RSEvents!Pro Archived Events module allows you to display a simple listing within a module position for archived events. Open links in: links that are generated within the module can be opened in a new window or in the current one. 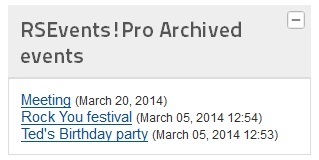 Number of events: this allows you to control the event list length. Event categories: the listing will incorporate events that belong to the specified categories. Leave empty for all. Event locations: the listing will incorporate events that occur in the specified locations. Leave empty for all. Event tags: the listing will incorporate events that contain the specified tags. Leave empty for all.